The aim of this study was to develop gluten-free bread formulated with red rice flour and microbial transglutaminase and prebiotic (inulin). First, the physicochemical analysis of minerals present in red rice flour was performed. Response surface methodology was used to analyze the effects of microbial transglutaminase (MTgase) [0.5; 1.0 and 1.5%] in combination with fermentation time (FT) [60; 80 and 100 min] on the quality parameters of gluten-free bread. 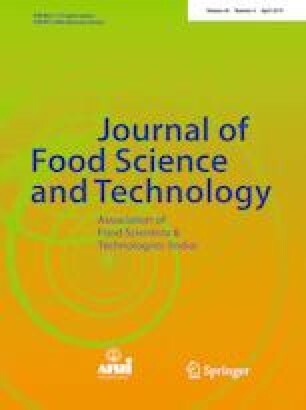 Acceptance test was used to evaluate the sensory characteristics of breads together with multivariate analysis of data. The addition of MTgase increased bread volume, hardness and chewiness. However, the cohesiveness and springiness of all breads remained unaffected. The formulation (1.0% MTgase and 80 min FT) presented the best sensory attributes through PCA (principal component analysis) and greater acceptance. Overall, red rice flour, prebiotic and MTgase are promisingly useful ingredients for the production of gluten-free quality bread.